Come to our Annual Holiday Bazaar! 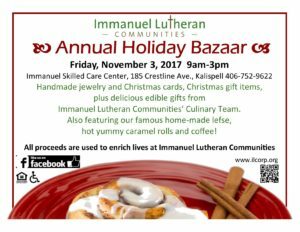 Enjoy a hot cup of coffee while you shop for holiday treasures, such as our signature homemade lefse, fresh cinnamon rolls, handmade crafts and edible gifts. Event Registration is not necessary for this event.